In a study conducted by the National College Players Association, based on a comparison between the 2011 national poverty line and Football Bowl Subdivision Series (FBS) room and board portions of full athletic scholarships, at least 85% percent of FBS players live below the poverty line. Similarly, Shabazz Napier, now playing for the Portland Trail Blazers, said during his time at the University of Connecticut that there were nights in college where he was hungry and did not have the money for food. There are not many businesses more lucrative than college sports, so why is this happening? One issue is a legality preventing college players from benefitting financially from their participation in college athletics—the inability to receive compensation for the televised broadcast portrayals of their likenesses. The right of publicity, which varies depending on the state and whether the claim is statutory or common law-based in nature, protects a person from the unconsented use of his or her likeness, for commercial purposes. The idea is simple: you cannot use someone else’s name or image, without their permission, to make money. So why can this idea not be applied to television broadcast? An important court decision that lends some guidance came down in August 2016 at the hands of the Sixth Circuit Court of Appeals. Javon Marshall, a former football player at Vanderbilt University, along with several other former college athletes, filed a lawsuit against ESPN, CBS, NBC, ABC, Fox, and eight NCAA athletic conferences. Marshall and the other athletes alleged violations of their Tennessee statutory and common law rights of publicity. All claims were denied. A big reason for the denial of the statutory claims was the choice of venue. Tennessee, whose law applied because the original suit was brought in Tennessee federal district court, clearly states that no right of publicity violation can arise from the use of an individual’s name, photograph, or likeness in connection with a sports broadcast. With respect to the common law claims, the plaintiffs relied on the only common law right of publicity claim heard by the Supreme Court, which held that a performer’s right was violated where he was secretly filmed doing a “human cannonball” routine and that footage was broadcast on Ohio television. The District Court rejected similarities between the cases, and noted that Zacchini does not stand for the existence of a right of publicity whenever anyone performs in an event produced by someone else. The Court, did, however, acknowledge that the First Amendment’s protection against right of publicity claims is not unlimited. It seems that the choice of venue played a huge role in the denial of these claims. Were these claims brought in a different jurisdiction, say, California, which applies the right of publicity more broadly, perhaps the result would have been different. Rulings from these jurisdictions may be college athletes’ last hope at being compensated for the portrayal of their likenesses in television broadcast, as the Supreme Court seems unwilling to weigh in on the issue. Jason Rozbruch is a first-year student at Fordham University School of Law. Prior to attending Fordham Law, Jason attended the University of Michigan, where he graduated with a major in History and a minor in the Afroamerican & African Studies Honors Program. Huma, Ramogi, and Ellen J. Staurowsky, E.d.D. “The Big Price of Poverty in Big Time College Sport.” Ncpanow.org. Accessed March 26, 2017. http://www.ncpanow.org/research/body/The-Price-of-Poverty-in-Big-Time-College-Sport.pdf. Sherman, Rodger. “Shabazz Napier: ‘We Have Hungry Nights’.” SBNation.com. 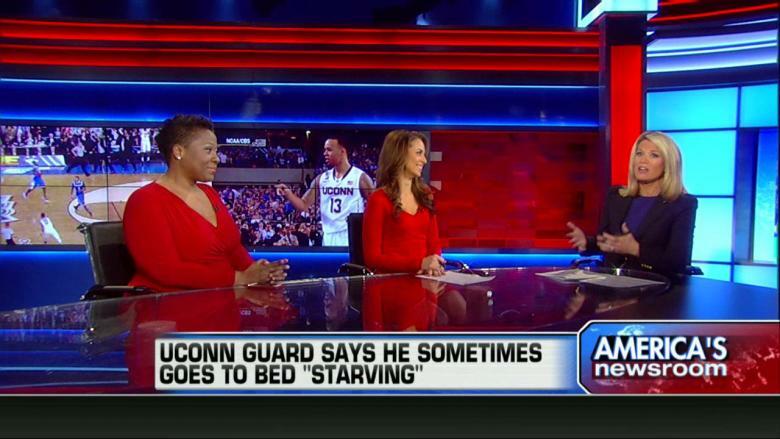 April 07, 2014. http://www.sbnation.com/college-basketball/2014/4/7/5591774/shabazz-napier-uconn-basketball-hungry-nights. See Marshall v. ESPN, No. 15-5753, 2016 U.S. App. LEXIS 15292 (6th Cir. Aug. 17, 2016). See e.g., N.Y. Civ. Rights Law §§ 50, 51 (LexisNexis2017) (stating that a person’s right of publicity is violated, when, without his or her consent, that person’s name, portrait, picture, or voice is used in trade or advertising). See Marshall v. ESPN, No. 15-5753, 2016 U.S. App. LEXIS 15292. Tenn. Code Ann. § 47-25-1107 (LexisNexis 2017). Zacchini v. Scripps-Howard Broad. Co., 433 U.S. 562, 573 (1977). See Marshall v. ESPN Inc., 111 F. Supp. 3d 815, 828-29 (M.D. Tenn. 2015). See generally White v. Samsung Elecs. Am., Inc., 971 F.2d 1395, 1399 (9th Cir. 1992) (holding Samsung liable for violating Vanna White’s right of publicity where they produced a commercial with a robot wearing clothing similar to her and spinning the Wheel of Fortune). This entry was posted in Lawsuit, NCAA and tagged Fordham Sports Law Forum, Jason Rozbruch, NCAA, Right of Publicity by Jason Rozbruch. Bookmark the permalink.